Product #22003 | SKU MCH-CF6B | 0.0 (no ratings yet) Thanks for your rating! The Ruggard Memory Card Case for 6 CF Cards is a sturdy protective case for your memory cards. It keeps the cards safe from shock and moisture. 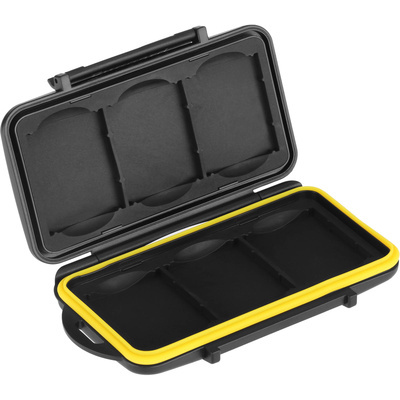 The case has a moulded rubber interior lining, as well as a durable polycarbonate resin exterior with a weather-resistant seal to keep out water, dust, and debris. There is a snap-on locking system and a moulded eyelet for attaching the case to a strap or hook. The individual card slots are designed to hold the cards in either direction, which helps with identifying which cards are empty or full.